I swung by Walmart and picked up another Jada and another Maisto. 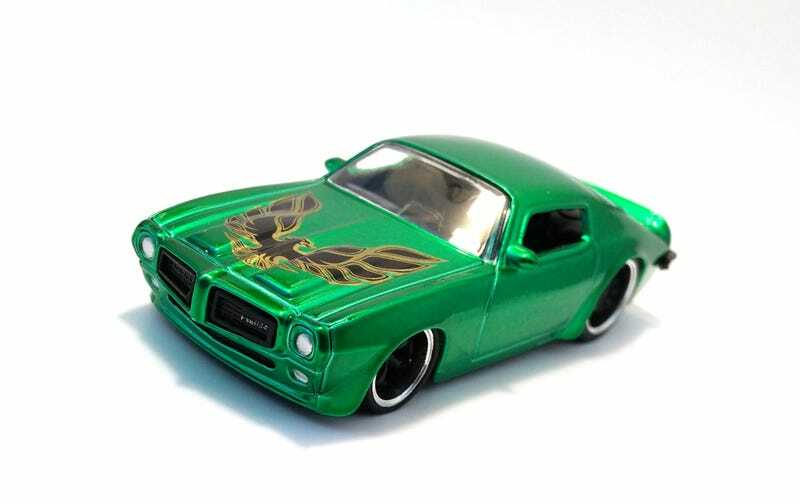 The Jada is a bright metallic green ‘70 Firebird. The first thing that struck me was the paint. In person, it’s a lot shinier than in these photos. It has the big bird emblazoned on the hood in typical Firebird fashion, though you don’t usually see it on this generation of Firebirds. I also like the wheels on this one even if they’re a bit on the blingy side. And here, we have the universal pegwarmer that is the Maisto Dodge Viper. When comparing the Jada with the Maisto, the Maisto feels downright cheap. The cast feels very light, the paint cheap, and the wheels and tires are not perfectly circular. Also, those rear wheel wells need to be filled up better. If this is what we can expect from Maisto at this scale, then I’m not exactly sure what to expect with their upcoming Ferrari’s.